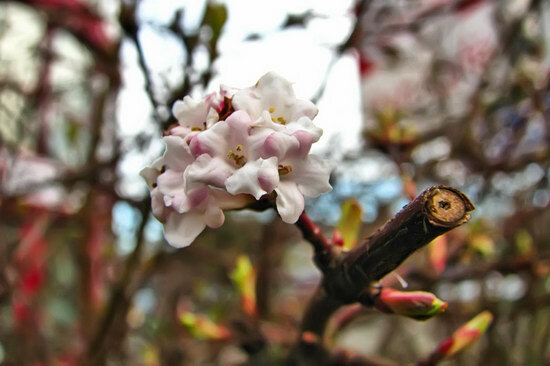 Thanks to Google+, this is no more a mystery flower: this is Viburnum Bodnantense, also called Bodnant-Schneeball, Winter-Schneeball or Duft-Schneeball here in Germany. It’s a hybrid plant that was created in the 1930s in England at the Bodnant Garden. Big thanks to +Patty Mitchell who also discovered these in California and +Ruth Hochholdinger from Vienna who finally identified them!